Celebrate Taco Tuesday the healthy way by losing the taco shell and opting for a salad. We love low-fat Mexican dishes like this healthy and fresh chopped taco salad. It provides a whopping 9 grams of fiber and 21 grams of protein, and is a relatively modest 360 calories. Celebrate Taco Tuesday the healthy way by losing the taco shell and opting for a salad instead. It's a great lunch or dinner, and as an added bonus, it's also 30-minute meal--just 10 minutes of prep and 20 minutes of cook time. 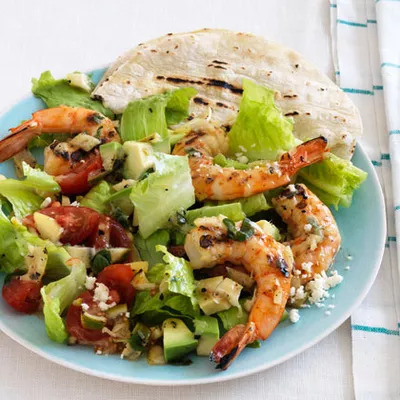 Ingredients: Cooking spray, lemons, limes, fresh oregano, extra-virgin olive oil, salt, black pepper, Romaine lettuce, shrimp, corn tortillas, tomato, avocado, Cotija cheese.